Horse buses had commenced operations in Wallasey in 1861, running from Seacombe to New Brighton, via Liscard Village, connecting the three ferry landing stages at Seacombe, Egremont and New Brighton. These ferries, which operated across the Mersey to Liverpool, came under the control of Wallasey Council in the same year. Although proposals to build a tramway had been put forward as early as 1870, it was not until 1878 that the Wallasey Tramways Company (authorised by the Wallasey Tramways Act of the same year) began to construct a single-line horse tramway between the ferry landing stage at Seacombe, via Brighton Street to Egremont, along Liscard Road to Liscard, then north via Rake Lane to Upper Brighton, terminating at the depot in Field Street, just to the south of New Brighton. The line opened on the 28th June 1879, with the service being maintained by the initial fleet of Starbuck single-deck cars (Nos. 1-7), joined in 1880 by five Eades double-deckers (Nos. 8-12). On the 20th April 1888, the Wallasey United Tramways and Omnibus Company was incorporated, and, on 8th May 1891, the Wallasey Tramways Company was merged with other horse bus interests into the new company. In 1893, seven Milnes double-deck cars (Nos. 13-19) were purchased. Wallasey Corporation exercised its option to acquire the undertaking (under the 1886 Act) in 1899, although delays meant that the actual completion date was 30th March 1901, on which date Wallasey took over operation of the horse tramway and seven cars (the Milnes double-deckers of 1893, which, by this time had been re-numbered 6, 7 and 10-14). The horse bus operations were not included. The Wallasey Tramways and Improvements Act of 1899 had authorised the Corporation to electrify and expand the existing horse tram system. The first electric trams ran on the 17th March 1902, when the line based on the old horse tramway (extended into New Brighton) was opened, although the official opening was not until 19th March 1902, when a second section of track from Egremont to Upper Brighton, a distance of around 2½ miles was brought into use. Later that year, on the 17th May, a third section was opened, linking Liscard with New Brighton, via Wallasey. The first electric cars were 25 ERTCW open-top double-deckers (Nos. 1-25), which were supplemented in 1903 by five more (Nos. 27-31), all of them having been fitted with top-covers by 1905.In 1907, the Corporation allowed R & J Evans to run a horse bus service between Seacombe and Poulton, which was an area not served by the new trams until 8th July 1910, when a new section of tramway between Seacombe and St. Luke's Church in Poulton was opened. On the 7th February 1911 a 2½-mile extension to Wallasey Village was inaugurated and the horse buses ceased. The system was now complete and over the next few years additional tramcars were added to the fleet, culminating in the deliveries of 1920, which consisted of 10 Brush top-covered double-deck cars (Nos. 69-78), seating 66 passengers. This was the year that the Corporation obtained powers to operate motorbuses, and the first service, between Seacombe and Harrison Drive, via Manor Road and St. Hilary Brow, commenced on 3rd April. The first buses were six AEC YC-type chassis (Nos. 1-6) with Hora B32R bodywork. They were registered using even registration numbers only, a practice unusually adopted by the motor taxation department, which meant that, until the 1948 deliveries when the practice ceased, consecutively numbered vehicles did not have consecutive registration numbers. The following year joint services into Birkenhead, with Birkenhead Corporation commenced, and motorbuses were used to augment the tram services at busy times. Other services followed; on the 19th July 1924 a service from Wallasey Village to the Foreshore commenced, which from 1927 was operated by a specially purchased toastrack bus; in 1927 a limited stop service between Seacombe Ferry and Harrison Drive was inaugurated with much success. On 1st April 1928 a service to Moreton commenced and by the end of 1929 more services had been introduced and the Corporation owned 56 motorbuses, so it was not surprising that, by the end of the 1920's, when the tramway system was in need of renovation, the Corporation decided to replace the trams with motorbuses. 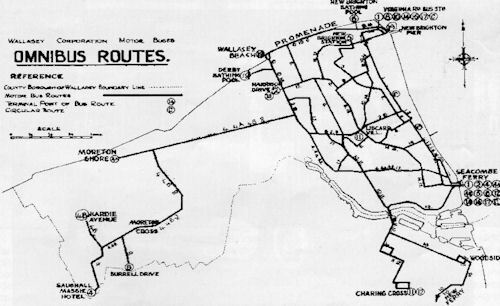 The first tramway route to succumb was the Seabank Road section, which was turned over to motorbus operation on 20th January 1929. In 1931, the trams on the Poulton and Warren Drive routes were merged to form a circular route, and the Warren Drive and Church Street sections ceased to run. The remaining sections of the circular route lasted until 30th November 1933, when the last tram (No. 68) ran in Wallasey, bringing the tramway era to an end. In order to accommodate the growing bus fleet a new depot had been built in 1929 on land adjacent to the tram sheds in Seaview Road, Liscard, and following the demise of the tramway system, the old tram shed became a repair shop, with additional accommodation for the bus fleet if required. The Corporation purchased its first double-deck motorbuses in April 1928 when 6 Leyland Titan TD1 chassis (Nos. 20-25) with Leyland 51-seat open-staircase bodywork entered the fleet, followed shortly afterwards by 6 Karrier DD6 chassis (Nos. 14-19) with Hall Lewis 66-seat bodywork. Late in 1929, the joint service with Birkenhead Transport was extended from Seacombe to New Brighton at one end and from Woodside Ferry to New Ferry at the other end. In 1933, a new ferry terminal and bus station was opened at Seacombe, intowhich buses reversed, allowing passengers to board by way of a covered walkway that reduced their exposure to inclement weather. Specifications for new buses in the early 1930's included a front exit to speed up unloading at the terminal. The front exitwas equipped with a folding door that was opened by the driver, who had to lean out of the cab to operate a lever above the front bulkhead window. The first buses to be built in this way were Nos. 57-62 of 1930, and the practice continued for a number of years, with the last dual door buses being purchased in 1936. Route numbers were introduced on 1st January 1931, coincident with Birkenhead Corporation, and new buses were subsequently equipped with route number indicators, which eventually became very large, with short route workings being shown in red lettering on a white background. New services continued to be introduced and there was a complete revision of services in 1934. Part of the new promenade at New Brighton was opened in the same year and on the 13th June 1934 Wallasey Corporation commenced operating a promenade service. By the time the promenade was completed in 1939, the service was being operated by four Leyland Cubs (Nos. 1-4) with Burlingham 25-seat coachwork, incorporating 'sunshine' roofs. With the onset of World War II in 1939, Wallasey Corporation, in common with other operators, suffered fuel restrictions, but it was the decline in the pleasure industry that caused most of the reductions in operations, although these were counterbalanced by a number of special wartime workmen's services to strategic sites. Several routes were withdrawn and others severely curtailed as the War progressed, but despite bombing attacks and much devastation locally, the depot, works and vehicles escaped relatively unharmed. When hostilities ceased, much of the route network gradually returned to normal and by the end of the decade Wallasey buses were running with full loads again. Postwar development saw the expansion of the Leasowe and Moreton areas, with more bus services and increased frequencies being introduced, along with a complete revision of the joint services with Birkenhead Corporation, which included a service acrossthe former toll bridge at Poulton. At the same time tourist services in the New Brighton and Wallasey area were re-organised, with frequencies increased for the steady influx of postwar visitors. The bus fleet was updated by the purchase of a number of Leyland PD1's in 1946 (Nos. 78-101), 1948 (Nos. 11-34) and Leyland PD2's in 1951 (Nos. 35-70), modernising the fleet considerably and enabling many of the prewar vehicles, which had suffered from lack of proper maintenance during the war, to be withdrawn. This was to be the zenith for Wallasey Corporation, as passenger numbers soared to over 36 million, with buses operating over 3 million route miles. Thereafter, the rise in the private ownership of the motor car, and the decline of the tourist trade in favour of destinations abroad, saw passenger numbers spiral slowly downwards, a trend suffered by many other operators at the time. This resulted in fare increases and service revisions, contributing further to the decline. In 1958, Wallasey took delivery of the very first production Leyland Atlantean (No. 1: FHF451), a high capacity bus seating 77 passengers, in an attempt to economise further. The higher passenger loads enabled some of the peak hour duplicates to be withdrawn, and, on occasions, they were operated as one-man vehicles with the upper deck closed off (double-deck one-man operation did not become legal until 1966). Wallasey Corporation was one of the first municipalities to experiment with minibuses when, in 1963, a Trojan 13-seater (No. 100) was introduced on route 22 between Martins Lane and New Brighton Station. This was a development of the Corporation's policy of introducing smaller buses into residential areas in the face of declining traffic, which had been instituted in 1962 with the purchase of a small batch of Albion Nimbus (Nos. 31-34), 31-seat single-deckers. These services met with moderate success, although by March 1965, the Corporation, with losses increasing, was forced to make drastic cuts in the bus network. In 1967, another series of cuts followed, along with a fare rise, and the centre of operations was shifted away from the ferry terminal, which was no longer the focal point of the borough as it had once been. By now the Corporation network was carrying just over 14 million passengers annually and the route mileage had fallen to just over 2 million miles, a major factor being the decline in popularity of New Brighton as a tourist resort. On the 1st December 1969, the 75 buses of Wallasey Corporation were merged with the neighbouring fleets of Birkenhead and Liverpool Corporations to form the Merseyside Passenger Transport Executive, bringing to an end almost 70 years of independent municipal operations in the borough of Wallasey. Thank you Peter Gould www.petergould.co.uk for the information.